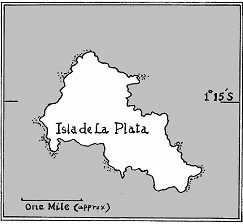 Some ten miles off the coast of Ecuador, north of the Gulf of Guayaquil, under Cape San Lorenzo, there is a small island named Isla de la Plata, meaning Silver Island as this Map 1 depicts. As the 17th-century Map 2 shows, the island has also been called "Sir Francis Drake's Isle." The modern survey Map 3 shows the island to lie across latitude 10 15' south and to be about three miles in the longest dimension. 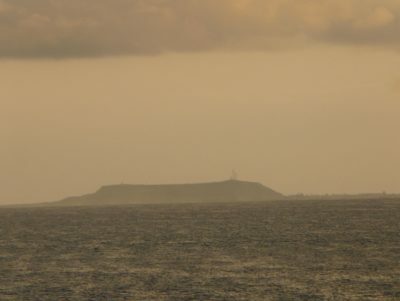 The island has not always had its present name, but gained it in 1579 after Francis Drake sailed up this coast in the Golden Hind in pursuit of the Spanish treasure ship Nuestra Señora de la Concepción , popularly called the Cacafuego meaning Shitfire . Today the Isla de la Plata is a nature reserve with bird colonies including the blue-footed booby. The Golden Hind was already carrying a considerable weight of treasure taken from various ships in ports and at sea along the west coast of South America. Then on 1 March, 1579, off Cape San Francisco, Drake took a massive additional haul from Juan de Antón captain of the Cacafuego . The two ships sailed away from the coast and the treasure transferred to the Golden Hind . After five or six days, Drake released Antón's ship and proceeded on his way, sailing across the Gulf of Panamá, reaching Caño Island in today's Costa Rica on 16 March, where the Golden Hind was unloaded and partially repaired on the mainland at the presently named Drake's Bay. "This island received its name from Sir Francis Drake and his famous actions. For here, it is reported by tradition, that here he made the dividend, or sharing of that vast quantity of plate which he took in this sea." "The island Plata, as some report, was so named by the Spaniards, after Sir Francis Drake took the Cacafuego, a ship chiefly laden with plate, which they say he brought hither and divided here with his men." "Departing from the point where he had taken the vessel, he sailed with a fair wind towards the north-west on the route to Nicaragua, and for three days to the north-northwest and to north, a quarter to north-west. During the first three days of fair weather, he transferred by means of the pinnace, all the silver from San Juan de Antón's vessel to his ship"
This quotation is just a small part of Pedro Sarmiento de Gamboa's graphic rendering of the capture of the Cacafuego , details which were given to him. Sarmiento was the most famous Spanish captain and navigator who was a member of the Spanish pursuit force following Drake. He wrote an overall account of all Drake's robberies on the coasts of Chile and Perú as well as the activities of the pursuit force. Sarmiento described in amazing detail everything that happened between the Golden Hind and the Cacafuego during the time they were together. Even conversations were reconstructed. However we must remember that Sarmiento was a very angry man when he interviewed San Juan de Antón and that he had an "axe to grind". He had strongly advocated that the pursuit force should follow Drake across the Gulf of Panamá towards "Nicaragua": instead the general in charge, Don Luis de Toledo, put in to Panamá. So, Sarmiento was anxious, perhaps over anxious to prove he was right on this particular point. Of course, Sarmiento's account about the Cacafuego is second-hand information, since he was not an eyewitness. This shows when, for example, he suggests that treasure was transferred at the same time as they were sailing with a fair wind in the first three days. Moreover there is information available to us from those who were there which casts doubt on some of the fine detail. "They robbed him of all the gold, silver and reals that he was carryingleaving the said ship after he had robbed her, he kept deponent with them for six days after the end of which he went away and left her." "After he had spoken with her (Cacafuego) we lay still in the same place for about six days to recover our breath again." "From this cape (San Francisco) before we set onward, March 7th"
"1st March on the first of March we took the ship Cacafuego, we released the ship on the fifth day at night. 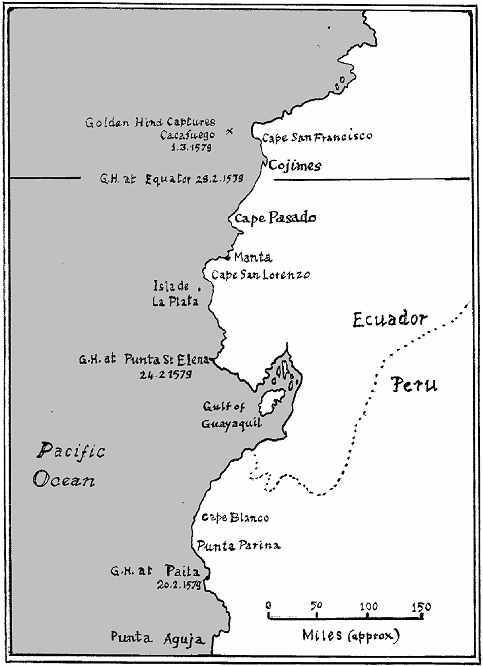 5th March on the fifth day at night, bound for Nombre de Dios, at Cape San Francisco." Thus, surprisingly, both these first hand accounts reveal that the Golden Hind was still in the vicinity of Cape San Francisco when the Cacafuego was released! But, perhaps it is not so surprising; they had entered the equatorial region where they would begin to lose the benefit of the prevailing wind and current which had borne them all the way up the South American coast. They would now be more likely to experience calms and the equatorial counter current. So where had they been in these six days? For a fleeting moment one wonders if they could possibly have used the time to sail back to the Isla de la Plata? To do so would have necessitated a round trip of about 300 miles, with the outward leg to the south requiring much more time against the prevailing wind and current than three days for the northward return. So, there was insufficient time and Drake would not have risked running into a pursuing force. Also there is no mention of an island in any of the contemporary accounts. Thus one can safely rule out a visit to the Isla de la Plata. One is left to wonder why a Spanish source thought he had done so. Most likely, they would have considered it very difficult to transfer heavy cargo from one ship to another in open ocean and to have needed a safe anchorage to achieve this. At sea, even using the pinnace, the transfer would not be straightforward in an ocean swell. To do so safely a calm would be preferable which is what John Drake said they had, and needed, in his second declaration to the Inquisition at Lima in January, 1587. It may well be a calm which is being referred to in the World Encompassed when it states that "we lay still in the same place for six days." Again calms are more common in the equatorial region and in the area of the Gulf of Panamá. I was able to replicate parts of the voyage of the Golden Hind up the Pacific coast of South America, sailing on a cruise ship in March 2008 from Valparaíso to the Panama Canal. This was a rewarding experience. One objective was to attempt to record photographic profiles of the coastline. On deck, equipped with map and hand-held GPS, I could know exactly which coastline, features and places we were passing. Alternatively, in my cabin, the ship's TV system depicted the moving ship on a map of the coast together with a record of the changing latitude and longitude. Thus, very conveniently, one could quickly be on deck, at first light, already knowing the ship's position, to attempt to record a profile. On 5 March in the early morning, we were passing northern Perú and had a good view of Paita, which Drake had entered on 20 February 1579. Drake had subsequently crossed the 150 mile Gulf of Guayaquil. Those on the Golden Hind would then have kept a careful lookout for the very characteristic shape, like an upturned boat, of Punta Santa Elena at 2° 15' south. No doubt they were assisted by the captive Spanish pilot Custodio Rodríguez. Punta Santa Elena was an important navigational aid in those days as it denoted the Gulf had safely been crossed. This prompted the World Encompassed to note the observation: "We fell with the port Saint Hellen and the riuer and port of Guiaquill Feb. 24." 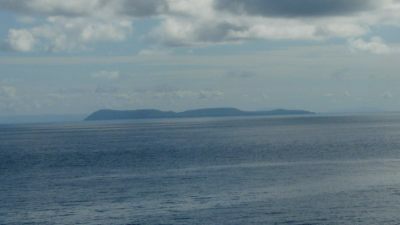 I saw the same view on 7 March 2008, from about 11 miles seaward. I was very fortunate to photograph the profile of the point as it was backlit by the very faintly illuminated early morning sky. I had found by then that such profiles are difficult to observe as conditions have to be just right at the time you happen to be in position! 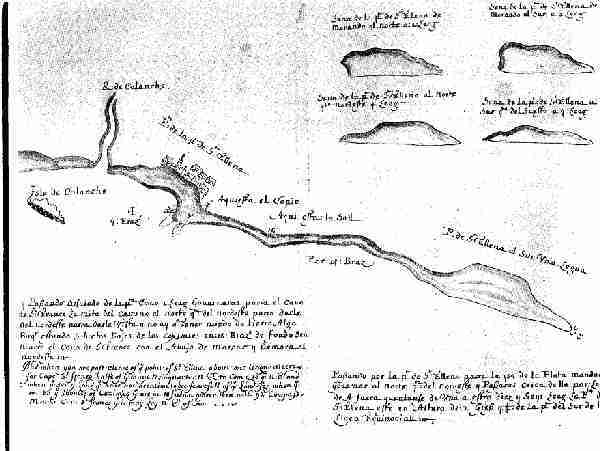 My view is shown in Fig 1 together with the view recorded in a 17th-century Spanish derrotero - a nautical atlas - for comparison. Later on, around 26 February, 1579, Drake would surely have noted the Isla de la Plata, although it is not mentioned in the English accounts. He would have been warned of its presence by the Spanish pilot; it is named "Isla de la Plata" and its position noted on the derrotero. Perhaps he thought of making use of the island if the Cacafuego had happened to come into view at that moment. He might well have been careful to avoid it by sailing on its west side. If so, and if in daylight, he would have gained the same views as I did on 7 March, 2008. My photographic profile in Fig 2 is from the south-west, 10 miles off. Profiles such as these, would have been included in Drake's journal of the voyage, provided to Queen Elizabeth I, now sadly lost. After passing Cape San Lorenzo [Map 1] my ship put into Manta. Cape San Lorenzo is carefully noted in the Spanish derrotero because of its characteristic rock formations, leading into the sea. Drake would certainly have observed these. I spent a very interesting day inland here, visiting Monticristi where Panama hats are made by hand. We left Manta in late evening which meant that Cojimíes and Cape San Francisco were sadly passed in darkness. 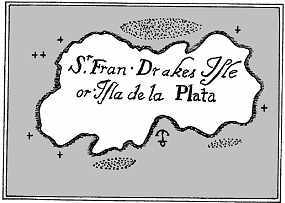 Francis Drake did not visit Isla de la Plata. Notwithstanding Spanish claims, he simply could not have done so. Although it seems rather a pity to strip the small island of its romantic association with the English hero, it is doubtful if that will make the slightest difference to the local Ecuadorian tourist trade, which gains much profit from the use of Drake's famous name so many miles from Devon. Close examination of the primary sources suggests that the robbery of the Cacafuego took place in an ocean calm. Drake was thus very fortunate, subsequently, to pick up a favourable wind for the passage to Caño Island.